﻿ Fun Easy English - Environment - Global warming - Climate change Impacts in the Southwest. The Southwest is the hottest and driest region in the nation. Extending from the Pacific Ocean east to the Rocky Mountains and south to the Mexican border, this region is home to about 56 million people, about 90% of whom live in cities, including Albuquerque, Phoenix, Las Vegas, Salt Lake City, Denver, San Diego, Los Angeles, Sacramento, and San Francisco. The population of the Southwest is expected to increase by nearly 70% by mid-century. The Southwest encompasses a wide range in elevations, spanning valleys that are below sea level to mountain ranges that contain some of the highest peaks in the contiguous United States. The region’s southern portion includes deserts, like the Mojave. In contrast, northern California, the Rocky Mountains, and the Sierra Nevada mountain range tend to get more precipitation and snow. The Central Valley in California is one of the most productive agricultural regions in the country. Climate change is affecting the Southwest. Temperatures have increased by almost 2°F in the last century, with the 2001-2010 decade being the warmest since records began 110 years ago. The length of the frost-free season has increased by 19 days in recent decades. Average annual temperatures are projected to rise an additional 3.5°F to 9.5°F by the end of this century, with the greatest temperature increases expected in the summer and fall. Drought conditions are already common in the Southwest and drought periods are expected to become more frequent, intense, and longer. Drought will affect important water sources, including the Colorado River Basin. Combined with expected population growth, climate change will exacerbate existing stresses. A reliable water supply is crucial for sustaining the people, agriculture, energy production, and ecosystems in this dry region. Increased water demand and reduced water supplies will add new stresses to already strained water resources. The Southwest relies on the slow melt of mountain snowpack throughout the spring and summer, when water demands are highest. Snowpack helps keep the ground and soil moist by covering it longer into the spring and summer, which delays the onset of the fire season and influences the prevalence and severity of wildfires. Over the last 50 years, there has been less precipitation falling as snow late in the winter and snow melt has occurred earlier. Maximum streamflow has also occurred earlier in the year and total yearly streamflow has decreased in the last decade. In April 2015, California snowpack held only 5% of the water it typically holds at this time of year, with some areas having no snowpack. 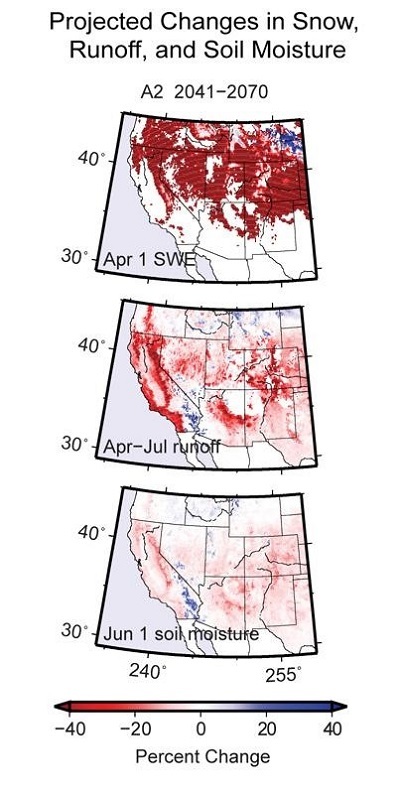 This was the smallest April snowpack in the last 65 years, and projections indicate continued declines in snowpack in the Southwest in the future. In addition to less snow accumulation, warmer temperatures are expected to speed snow melting, and rain falling on snow could result in more rapid runoff and flooding conditions in spring. Increasing temperatures will also increase evaporation, causing river-flow reductions and dwindling reservoirs. Rapid population growth will increase the competition for water resources across sectors, states, tribes, and even between the United States and Mexico. Climate change will likely stress groundwater-based systems and result in decreased groundwater recharge. The Southwest is home to 182 federally recognized tribes and communities. Native Americans already face many challenges that will be exacerbated by climate change. These communities face some of the highest poverty rates in the nation and often lack adequate food, infrastructure, transportation and access to health and community services. Some communities, including the Navajo Nation, are already experiencing drought impacts. Some shallow wells have run dry and have reduced drinking water supplies. There have been reported losses of agricultural crops and livestock, as well as important medicinal and cultural plants and animals. As climate change impacts worsen, Native American populations will likely be limited in their ability to respond to increasing hardships, making them especially vulnerable. In the Southwest, more than 90% of the population live in cities, the highest percentage of any U.S. region. Pavement and buildings retain heat, creating urban heat islands that make cities warmer than surrounding areas and drive residents’ vulnerability to heat-related illnesses. 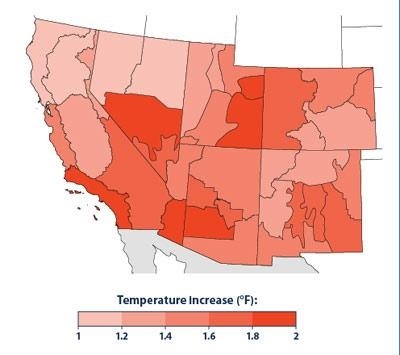 Heat stress is the leading cause of weather-related death in the Southwest, with a greater number of deaths expected as heat waves increase in number, length, and intensity. Elderly populations and low income households that may not have access to air conditioning are especially at risk from heat stress. High temperatures also contribute to poor air quality, including the formation of ground-level ozone, which poses a risk to people with asthma and other respiratory illnesses. Health problems are expected to be further aggravated by disruptions to urban electricity and water supplies. Greater energy use for cooling during heatwaves is likely to place additional strain on the electric grid and could result in brownouts or power outages. Greater water demand in growing cities and reduced water availability could also affect access to drinking water. For more information on climate change impacts on human health, please visit the Health page. Projected increases in drought, wildfire, invasive species, and pests, as well as changes in the geographic ranges of species, will likely threaten native forests and other ecosystems in the Southwest. More severe drought and warming temperatures are threatening forests in the region and making them more vulnerable to other stresses, including pests. Warmer, drier conditions, combined with the accumulation of dead trees and other fuel have contributed to an increase in the size of wildfires in recent decades, resulting in extensive and costly damage. Fire is a natural occurrence in the Southwest, but excessive wildfire destroys homes, transforms ecosystems, threatens public health, and damages the economy. The 2003 Grand Prix fire in southern California alone caused $1.2 billion in damages. Approximately 40% of the region is estimated to be vulnerable to changes in the distribution of abundant plant species as a result of recent and projected climate change. Fires will likely change the location of forests and other ecosystems, and changes in climate will likely drive the migration of species northward or to higher elevations as species colonize areas with more tolerable climatic conditions. In California, over 3,000 native plant species are expected to face reductions in hospitable geographic range. Iconic species and landscapes, such as that of the Saguaro cactus in the Sonoran Desert, are also being threatened. For more information on climate change impacts on forests, please visit the Forests page. To learn more about climate change impacts on ecosystems, please visit the Ecosystems page. California produces more than half the nation’s high-value specialty crops, including many types of fruits, vegetables, and nuts. Future production of these crops is likely to be affected by both reduced water availability and rising temperatures, resulting in local economic challenges and increasing food prices across the nation. The majority of the Southwest utilize irrigated croplands. As the region continues to become warmer and drier and as the population grows, more freshwater may be diverted from irrigation use to urban areas. Warmer temperatures could also result in more heat waves, a longer frost-free season, and fewer cold snaps. These changes are likely to cause crops to ripen and mature early, reducing some crop yields. As climate change intensifies, a northward shift in agricultural production in the region could occur. Livestock production in the Southwest is also expected to be affected by changes in water availability and temperatures. Pasture lands are not irrigated, potentially reducing grazing lands to drought while warming temperatures impose additional stresses on livestock. For more information on climate change impacts on agriculture and food supply, please visit the Agriculture and Food Supply page. Warming temperatures and reduced snowpack have been observed in recent decades in the Southwest. Increasing temperatures and more frequent and severe droughts are expected to heighten competition for water resources for use in cities, agriculture, and energy production. Native communities are expected to experience more difficulties associated with access to freshwater, agricultural practices, and declines in medicinal and cultural plants and animals. Drought, wildfire, invasive species, pests, and changes in species' geographic ranges will increase threats to native forests and ecosystems. Climate change can intensify multiple stresses that push a species past a survival threshold. 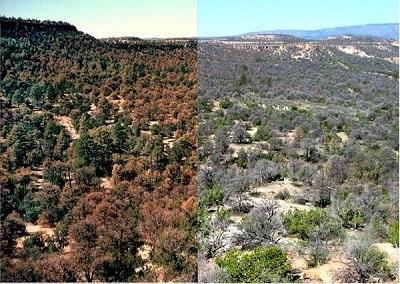 In 2000-2003, the combination of severe drought and unusually high temperatures led to a significant die-off of piñon pines in the Four Corners region of the Southwest. Piñon pines are very drought tolerant and have survived dry periods in the past. However, in 2000-2003, high temperatures worsened drought conditions, making the piñons more susceptible to pine bark beetle attacks. In some areas, more than 90% of the piñons died, resulting in major ecosystem changes over a large area. Warmer winter temperatures are also leading to worse bark beetle outbreaks because more beetles are able to survive through the winter and reproduce.